Afshar, Mehran, Mao, Fengxin, Jiang, Haichun, V. Mohles, Schick, Michael, Hack, Klaus, Korte-Kerzel, Sandra, Barrales-Mora, Luis A.. Simulated (a,b) particle number density and (c,d) mean radius of AA6016 for a heating rate of (a,c) 5 K/min and (b,d) 10 K/min. A detailed understanding of precipitation is essential to alloy and process design in age hardened metals, but experimental observation of the underlying processes is challenging. To accelerate such investigations, we introduce a model to simulate Differential Scanning Calorimetry (DSC) curves. 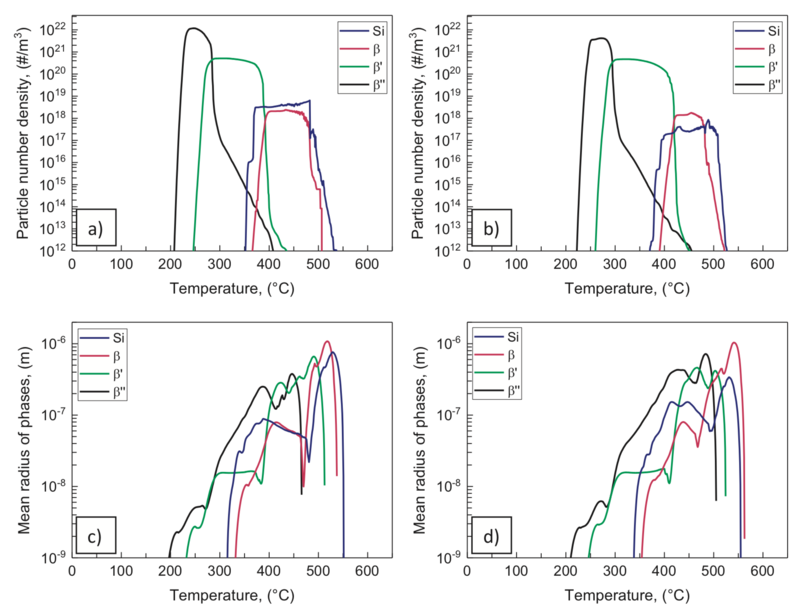 The precipitation behavior of an AA6016 aluminum alloy was simulated by a classical nucleation and growth model, coupled with a thermodynamic database containing Al, Mg, Si, Fe, Cu and Mn and their corresponding stable and metastable phases. The focus was laid on the evolution of the phases β′′, β′, β (Mg2Si) and Si under isothermal and non-isothermal conditions. DSC tests with rates of 5 and 10 K/min were conducted in the temperature range of 100–500 °C. The simulations were compared to these experiments. Transmission Electron Microscopy (TEM) was used to verify the precipitate phases and their sizes. The simulation results agree well with the experimental DSC curves and particle sizes.